... 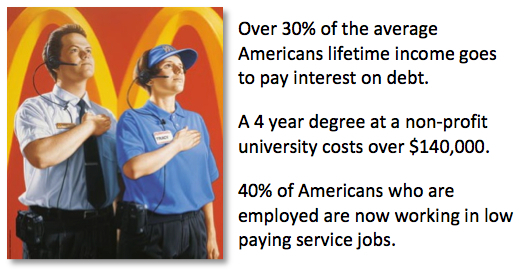 The sad truth is that consumerism and debt have very slowly put many American's into a very uncomfortable position. The GOOD NEWS is... they are now waking up, and taking steps to reclaim their financial freedom. 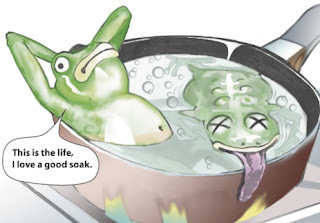 The boiling frog story is a widespread anecdote describing a frog being boiled alive. The premise is that if a frog is placed in boiling water, it will jump out, but if it is placed in cold water that is slowly heated, it will not perceive the danger and will be cooked to death. The story is often used as a metaphor for the inability of people to react to significant changes that occur gradually, as well as our ability to become complacent, even when uncomfortable. Whether factually correct or not, it is a great metaphor for what happens with debt. Imagine you go to bed happy and secure knowing you are completely debt free but you woke up the next morning to find out you were now over $200,000 in debt. How would you feel? Yet many of us have taken on that kind of debt, and more. The average credit card debt is now over $10,000. (up from $7800 in 2010) while the average mortgage is over $240,00 and the average new car loan is over $24,000. For Americans with debt, the average has somewhere between 11 and 13 different loans or lines of credit. So, are YOU a boiled frog in the metaphorical sense? Debt is not acquired all at once; but gradually over time, making it seem acceptable, even normal. But the consequences of debt can be devastating, as we are seeing around us every day now. The financial consequences, such as bankruptcies and foreclosures, are obvious. However the related consequences are like ripples in a pond. Financial stress is a leading cause of divorce, breaking up families. Employers are now reluctant to hire someone with a bad credit score, making financial recovery even harder. Studies show that 20% of employees suffer from financial stress that affects their productivity at work (and their jobs). I’m sure you can think of additional “ripples” yourself. Even for those that are not in financial “stress,” debt is costly… with over 30% of the money earned during our lives going to pay the interest on debt. That was money that could have gone toward other things. Debt affects our children. The instability of having a family break apart or being homeless is at one end of the spectrum with the other end being a “hidden consequence.” The hidden consequence? A four year degree at a non-profit university now costs over $140,000, meaning that less and less families are able to give their kids the start in life they would like, and that they deserve. Debt is a cancer in our society. 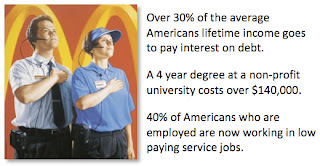 It turns people into “wage slaves” working in jobs they hate, simply to keep their health insurance and service their debt. So, is it time to “wake up” the boiled frogs in America? We, that are part of Worth Unlimited, think so. That’s why we are so passionate about sharing the good news of this award winning program that, for the first time in history, gives people a proven, yet SIMPLE tool that makes it easy to stick to our financial goals, save the money we work so hard to make, and get out of debt. Our average client is getting out of debt completely in 7-11 years withOUT changing their budget or lifestyle. With the average amount of interest saved being over $120,000, this means that clients are saving over $900 in interest every month of program use (obviously the majority of that savings is at the beginning of the program). Your savings could be a bit less, or a lot more. But ask yourself this… what would YOUR life be like if you had no debt? Wouldn’t you love to be a “happy camper” with no financial stress? Wouldn't TODAY be a great day to spend 5-10 minutes getting a FREE Savings Analysis done to see what your (guaranteed) savings could be using this system? "This is the best financial decision I've ever made, I wish I had started much sooner." "Unbelievable!!! At first I was very skeptical of a system that could help you pay off a mortgage with no change to your current lifestyle! Like most of us, the 'too good to be true' saying applied here. After persistence from my agent/friend I decided to look at the presentation, and now I am a client. I could not be more excited for my family, as well as the people I will be contacting to help them be truly mortgage free! Thank you for developing and offering this great tool. I hope that others who read this who are on the fence right now might get off the fence and make their dreams a reality too!" ... Mike & Laurie M.
"It has helped me to get the mortgage payments to finish much sooner than doing it on my own. I can now pay off the 30-year mortgage in about 8 years. I wish I knew about this 5 years earlier. Thanks." ... Arun & Kanak L.
"This is the best financial tool/info that I allowed someone to explain and sell to me. I rate it as high as the invention of the iPhone, Windows and any financial info. I think financial planners should definitely have this available to them (or at least knowledge of it) as should Insurance and Mortgage Brokers, and tell their clients about it. Thank you for a really great financial tool." ~~ Good point- and most of our Referral Partners ARE financial professionals! "With the state of the economy and the level of consumer debt we had, we could not qualify for a mortgage. But with the Worth Account, we're going to have our credit cards paid off and be in our new home quicker than we ever imagined... we're so excited for the future!" ... Sarah & Bill G.
"I think this is the future of mortgage control. I mean, if everyone who has a mortgage would use this system, the country would be in a much better state. People would actually own their homes and have their money back in their pockets for their future. Even if you don't keep your house 'til it's paid for, the equity you build in such a short time is amazing. I personally had 17 years left on my mortgage (paying bi-weekly) and with this program I will own it in less than 5 years. Great product!" The System is the tool that my wife and I have been looking for years. We realize that this is more than just a system to help us payoff our mortgage, but a way to efficiently manage our lives, finances and future. Thanks for this life-altering experience." "By using the program I can see my goal of being mortgage free! Before I was only hoping to get there!" ... Ben & Maria M.
"As soon as I saw the program, I knew it was one of the most powerful financial concepts that I had ever seen." "The program was very easy to follow and input for my own personal needs. I am very, very excited to know my mortgage will be paid off in 5.9 YEARS. Everyone with a mortgage should have this opportunity to be free and clear of a mortgage payment. For me this a plan I can truly believe in for my future retirement." "My husband and I have been 'struggling' with making a decision as to whether or not to invest in the program. I turn 60 next month and he is just a few months short of 61. We're in, what I would consider to be, the low middle-income bracket. We feel that overall we've been relatively conservative in our lifestyle and have put back a decent retirement account. However, in the last 11 years we've had some bad financial advice and have purchased two homes after having our first paid off early. My husband had a stroke, no risk factors, at the age of 58. We have put everything in order for us both, with the exception of paying off a new home we just moved into in December of 2004. I am extremely excited to be moving forward with the program. After viewing my on-line training, I am even more excited. I see more potential in the program than I even believed true before 'buying into' it. I can't wait to get started and see our mortgage balance drop. I hope to be one of your best Ambassadors in the future!" "Where were you guys 10 years ago? Just want to let you know that you have a great program and I am telling all my friends and family about it! Your support division is very helpful and professional. The best-kept secret to help people pay off their mortgages. Keep up the good job." "We've been on the program for 1 1/2 years, and this is the best financial move we have ever made. Thank You." ... Sandy & Mike M.
"This product and process is an answer to many of our financial needs and inquiries we had made to financial planners in the past." ... Scott & Eileen F.
"I approached my husband numerous times over our 26 years of marriage, to sit down and formulate a budget plan, but he has never appreciated accountability as much as I have. After much research I decided to take a risk and make an executive decision to purchase the software. I want to share with other spouses who want to gain better money management skills with a simple system. This program is beyond anything I have ever seen as far as mortgage accelerators. This is by far the best laid plan I have ever had the privilege to be a part of, and guess what? My husband is happily on board! Thank you all for your outstanding customer service!" I love watching the number of years go down on the screen as I spend a little less, or earn a little more, each month. I have even used some money that I was afraid to spend to purchase carpet and a new furnace for our home. With the software I was able to see that I could still make these purchases and pay off my home in under 13 years as opposed to 26!" ... Sarah & Michael F.
With 70,000 clients we can’t give you all the testimonials, however there are over 1000 more of them on the company website. For more information, and to get a FREE Saving Analysis, simply grab your statements from last month and call in. It takes just 5-10 minutes to give your Worth Coach the numbers they need to tell you when you can be debt free using this system. No “personal” info, like account numbers or names, is needed. Just balances, payment amounts and interest rates, plus an idea of your average income. Simple.